Under a Contractor Team Arrangement (CTA) two or more GSA Schedule contractors work together to meet ordering activity needs. By complementing each other's capabilities, the team offers a total solution to the ordering activity's requirements. Contractor Teaming Arrangement (CTAs) are potential areas of misunderstanding between contracting parties. As noted above, under a CTA, each team member bills the Government based on its own GSA Schedule rates. Conversely, if a prime contractor/subcontractor relationship exists (rather than a CTA), the prime contractor should bill for services (i.e. labor) performed by subcontractors at the prime contractor's GSA Schedule rates, rather than at the subcontractor's rates. It is important then to clearly establish the exact nature of the relationship that exists when bidding on GSA Schedule work. There have been cases where contract auditors have found billing issues related to how CTAs bill for their work and how GSA contractors bill for subcontractor efforts. 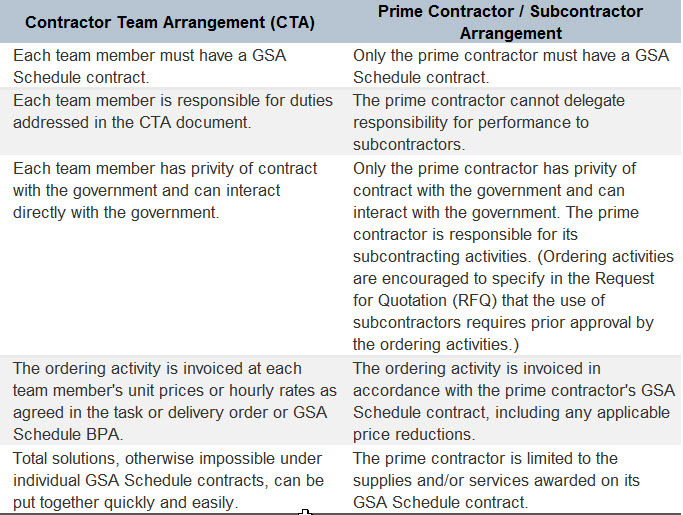 Another complication is FAR 52.232-7(b)(4)(ii), which, if included in the GSA contract, specifically limits the reimbursement of costs in connection with subcontracts to the amounts paid by the prime contractor for the effort of the subcontractor. 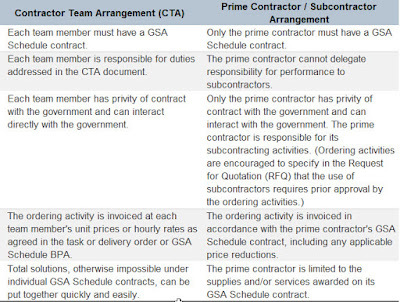 This means that prime contractors cannot pay a subcontractor less than its GSA Schedule rates.